My husband grew up in a family that played games....lots of games. But of particular note are two games that were played because Brian's father was Armenian; Tovli (backgammon) and Fertgal (Nine Man's Morris). When we lived in the Middle East we had the privilege to visit Damascus and purchase a beautiful Tovli board inlaid with Mother of Pearl which looked very similar to the one Brian's grandparents had owned. 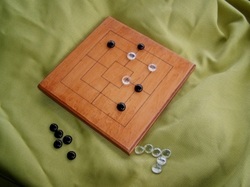 However, when it came to teaching games to our children, he realized that we had no Fertgal board, so he decided to make one. That was our first handcrafted game board. We have homeschooled our family for several years (although this year we are taking a hiatus) and as we began to study the history of ancient civilizations we learned about several games that were played in those civilizations. Brian began making some of those games for us to play as a supplement to school; usually as a Christmas gift to the kids. I thought they were so beautiful that Brian should consider selling them. Well, he really didn't take me seriously until we took some to an indoor 'garage' sale at a homeschool co-op. He sold more of those games than I did any of my 'stuff' and everyone that walked by simply raved about how beautiful and unique they were.